How Far is Serene Indus Valley? Serene Indus Valley is one of the residential development of Serene Senior Living, located in Coimbatore. 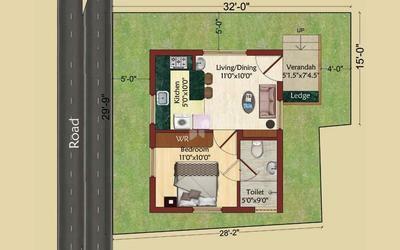 It offers 1BHK, 2BHK and 3BHK luxury retirement villas. Project has been designed to facilitate perfect living conditions with optimum light, ventilation and privacy, coupled with fresh and green surroundings, each villa brings the joy of unhindered living. Structure: RCC Stub Column with RCC bracings at Ground Level. Superstructure in Brickwork/Flyash Brick in Cement mortar. Staircase: Flame treated granite for steps with SS handrails. MS handrails for sitout. Compound Wall: Common compound wall asper design and Steel Gates.